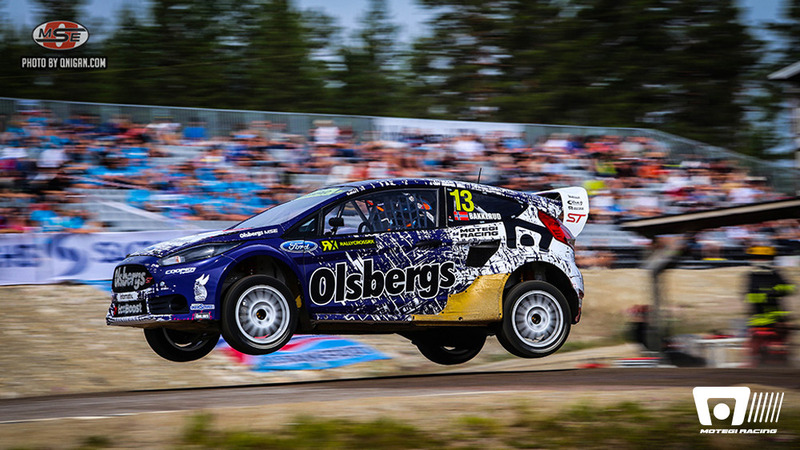 HÖLJES, Sweden (July 6, 2014) – Andreas Bakkerud battled to a second-place finish for the Olsbergs MSE Ford team this weekend at the “Magic Weekend” in Höljes, Sweden, home to the fifth round of the FIA World Rallycross Championship. “It’s a good weekend when it ends with a taste of champagne,” said a happy Bakkerud, who has driven his Olsbergs MSE Ford Fiesta ST to three second-place results and one win so far this year. Bakkerud ran more than half of the six-lap Final on a flat tire while fighting door-to-door with World Rally Champion Petter Solberg. In a nail-biter of a finish, he crossed the line in second place — ahead of Solberg and behind DTM star Mattias Ekström. Bakkerud’s teammate Reinis Nitiss narrowly missed out on the third podium position. After a stall on the start line in the Final, he made an incredible comeback to push through the pack and into podium contention. It was a virtual photo finish at the checkered flag as Nitiss captured fourth in his Olsbergs MSE Ford Fiesta ST, less than a tenth of a second behind third-place Solberg. Among the estimated 35,000 fans in attendance this weekend in Höljes was an enthusiastic all-blue cheering section some 300 strong. These fans traveled from Bakkerud’s hometown of Bergen, Norway, to lend their support to the driver. “It’s really good to have fans come out to support the team. I can see the smiles on their faces when they’re cheering for me and they give me the energy that I need to go forward,” said Bakkerud. As the championship season moves toward its mid-point, Bakkerud and Nitiss are both in a strong position for the overall title. 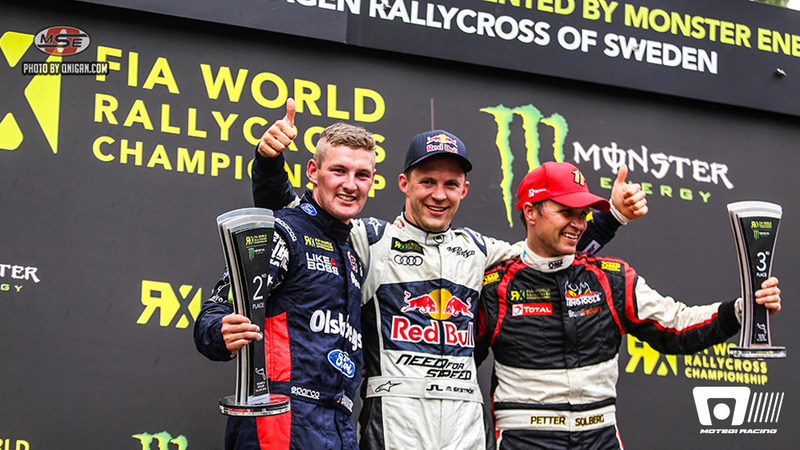 Nitiss remains in the championship lead, while Bakkerud is in third place, behind Solberg. In the chase for the team championship title, the Olsbergs MSE Ford squad has a commanding lead of 59 points. Sebastian Eriksson, who moved into the Supercars category as a guest driver with Olsbergs MSE this weekend, put in a fantastic effort in his Ford Fiesta ST. Lined up on the front row for the Final, he got a great start to claim the Monster Energy Supercharge Award. He looked set to earn a podium position until he clipped a curb and damaged his suspension. Although he held on for two more laps, he finally spun out of contention. He scored sixth-place points for the team. Daniel Holten, who also made a guest Supercars appearance for the team this weekend, was showing strong pace until a mechanical issue sidelined him in the Semifinal round. A highlight in the rallycross calendar, the Swedish round of the FIA World Rallycross Championship attracted a record 40 Supercars — the biggest ever Supercar entry at Höljes — as well as a strong entry in the Super 1600, Touring Car, and RX Lites divisions. Olsbergs MSE driver Kevin Eriksson took the win in RX Lites to extend his points lead in the RX Lites Cup. Next, World RX moves to a new venue, the Circuit Jules Tacheny, for the Belgian round of the championship July 12 and 13. The FIA World Rallycross Championship presented by Monster Energy combines all the best aspects of motor racing in one. It’s fast, competitive and spectacular. It’s bold, authentic and relatable. Within it are all the elements of four-wheel racing that you love. The race action is broadcast in more than 100 countries with a combined household reach of 816 million homes. The championship is made up of 12 rounds: Portugal, Great Britain, Norway, Finland, Sweden, Belgium, Canada, France, Germany, Italy, Turkey and Argentina. OMSE is a Ford Racing technical partner, developing the Ford Fiesta platform for international competition. Together, Ford and OMSE have earned an astonishing 20 X Games medals, including podium sweeps at the world’s leading action sports contest (Los Angeles, 2011; Brazil 2013). The team has also scored every rallycross championship in the United States since the sport debuted in that country in 2010, and its drivers are podium regulars in European competition. Founded in 2009, the organization represents a partnership between historic Swedish industrial company Olsbergs and rallycross specialists Motor Sport Evolution. In 2013, the company expanded its operations into the United States and now has dual headquarters with operations in both Nynäshamn, Sweden, and Huntington Beach, Calif. In 2014, OMSE campaigns leading cars in World RX, the Global Rallycross Championship, and the Rallycross Supercar Scandinavia championship.